As per team tradition, the Packers select game captains each week. Tonight’s captains will be T Bryan Bulaga (offense), S Morgan Burnett (defense) and LS Brett Goode (special teams). – NFL Network will air the game, starting Aug. 13, 2015 at 6:30 p.m. CT.
– Watch a replay of the game on your desktop, connected TV, tablet or smartphones with NFL GamePass. – If you’re looking for a bar to watch the game at, try www.packerseverywhere.com. Packers Everywhere was created to let you know where you can gather with other Packers fans to watch games and have all kinds of other Packers-related fun. – Flagshipped by Milwaukee’s WTMJ-TV and in conjunction with WGBA-TV in Green Bay, the game will be televised over the 16-station Packers TV Network throughout the state of Wisconsin, Upper Michigan, northeastern Minnesota, the Quad Cities, Des Moines, Cedar Rapids and Waterloo in Iowa, Omaha in Nebraska, Anchorage, Fairbanks and Juneau in Alaska and Honolulu in Hawaii. – The top-notch broadcast team includes CBS’s Kevin Harlan (play-by-play) alongside fellow CBS broadcaster Rich Gannon (analyst), with Rod Burks of WTMJ-TV and Olivia Harlan serving as the sideline reporters. An informative half-hour pregame show will air prior to the game, hosted by Lance Allan of WTMJ-TV, and featuring former Packers tackle Mark Tauscher. – In addition to WTMJ-TV (Milwaukee) and WGBA-TV (Green Bay), preseason games will be televised over WKOW/ABC, Madison, Wis.; WAOW/ABC, Wausau/Rhinelander, Wis.; WXOW/ABC, La Crosse, Wis.; WQOW/ABC, Eau Claire, Wis.; WLUC/NBC, Escanaba/Marquette, Mich.; KQDS-TV/FOX, Duluth/Superior, Minn.; KGCW-TV/CW, Davenport, Iowa (Quad Cities); KWWL-TV/NBC, Cedar Rapids/Waterloo, Iowa; KCWI-TV/CW, Des Moines, Iowa; KMTV-TV/CBS, Omaha, Neb. ; KYUR/ABC, Anchorage, Alaska; KATN/ABC, Fairbanks, Alaska; KJUD/ABC, Juneau, Alaska; and KFVE-TV in Honolulu, Hawaii. – In its fourth season, in conjunction with the Packers TV Network, Telemundo Wisconsin (WYTU-TV in Milwaukee, WACY-TV/My32 in Green Bay/Appleton and on Charter Cable elsewhere in Wisconsin) will broadcast four preseason games with Kevin Holden (play-by-play) and Epigmenio (Epi) Guerrero (analyst) calling the action. – Milwaukee’s WTMJ (620 AM), airing Green Bay games since November 1929, heads up the Packers Radio Network that is made up of 50 stations in five states. Wayne Larrivee (play-by-play) and two-time Packers Pro Bowler Larry McCarren (analyst) call the action. McCarren first joined the team’s broadcasts in 1995 and enters his 21st season calling Packers’ games. After originally being paired together in 1999, McCarren and Larrivee enter their 17th season of broadcasts together. 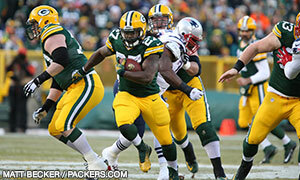 – The Packers improved to 9-3 on the season with a 26-21 victory over the New England Patriots on Sunday at Lambeau Field. Green Bay has won seven of its last eight contests against AFC teams at Lambeau Field. – Green Bay is off to a 6-0 start at home for just the second time in the last 12 seasons (also 2011). It marks only the Packers’ fifth 6-0 start at home since the 1970 AFL-NFL merger (1996-97, 2002, 2011). – The Packers led 13-0 at the end of the first quarter on Sunday. In its last five home games, Green Bay has outscored its opponents 79-0 in the first quarter and 151-23 in the first half. – The Packers will stay home to host the Atlanta Falcons next week on Monday Night Football. It marks the second straight season that the Falcons will visit Lambeau Field in Week 14 (both meetings on Dec. 8). – Today’s paid attendance was 78,431, a new Lambeau Field record. It was the 307th consecutive regular-season sellout at the stadium. – QB Aaron Rodgers extended two NFL records by bringing his streak at home to 360 consecutive passing attempts without an interception and 31 consecutive touchdown passes without an INT. – Rodgers threw for 282 yards in the first half, the fourth time in the last five games that he has thrown for 275-plus yards in the first half. His four 275-yard passing efforts in the first half this season are the most by an NFL quarterback over the past 25 seasons (1990-2014), with no other QB posting more than two in a season over that span. – With two TD passes on Sunday, Rodgers now has thrown 220 TD passes in his career with just 55 INTs, bringing his TD/INT ratio to 4.00 (No. 1 in NFL history). – Rodgers’ 368 passing yards on Sunday were a season high at Lambeau Field this season. – WR Jordy Nelson caught his 10th TD pass of the season, making him and WR Randall Cobb the first duo in franchise history to both catch 10-plus TD passes in the same season. – Nelson’s 45-yard TD catch in the second quarter was his sixth TD reception of 40-plus yards this season, which is tied for the second most in a season in team history behind only Billy Howton’s seven 40-yard TD catches in 1952. – Nelson has caught at least one TD pass in all six contests at Lambeau Field this season. – With 14 points on Sunday, K Mason Crosby went over the 1,000-point mark for his career, joining K Ryan Longwell (1,054) as the only players in franchise history to eclipse the 1,000-point plateau. – Crosby also brought his season total to 102 points, his eighth career 100-point season, which ties Longwell (1997-2004) for the franchise record. – WR Davante Adams registered the first 100-yard receiving game of his career, finishing with 121 yards on six receptions (20.2 avg.). – TE Richard Rodgers caught a 32-yard TD pass in the first quarter, giving him a TD grab in his second straight game. – The Packers converted 10 of 17 third downs on Sunday, a season-high 58.8 percentage. – Green Bay registered a sack in its 32nd consecutive game, extending a franchise record as well as the longest current streak in the league. If you don’t see the chat transcript above, click here. As per team tradition, the Packers select game captains each week. Today’s captains will be QB Aaron Rodgers (offense), CB Sam Shields (defense) and P Tim Masthay (special teams). New England has moved back into the first round at No. 25 to take Alabama LB Dont’a Hightower. That’s two picks, both on defense in the front seven, for the Patriots in the last five picks. Remember, the Patriots were criticized for their defense last year, much like the Packers were. They were clearly targeting upgrades, making trades up to 21 and to 25 to get two guys, Jones and Hightower.